Andrea Carter is no stranger to trouble, but her carefree ranch life is about to be turned upside down in ways she never could have imagined. Who is the half-dead man Andi and her friends find lying in the creek? Who are the travel-weary young woman and three unruly children who suddenly show up at the Circle C? Why has Andi's family been keeping such an important secret from her? I thoroughly enjoyed listening to this next adventure in young Andi's life. From book to book we see her growing up, and in Family Secret we see her face one of her hardest challenges yet: another older sister no one told her about. I feel like long-lost relative stories can so easily be cliche, but Susan K. Marlow keeps this story fresh and realistic: Andi battles the full spectrum of emotions as she tries to grasp and respond to this revelation; the reasons for the older sister's disappearance years ago and the family's secrecy since are very understandable; and the repercussions of this sister's re-appearance affect every character -- and every event -- in the story. As usual, I was hooked into this story from the very beginning. I was impressed even more by Annette Roman's narrations, since this book features an even more diverse cast including young children and a friendly (or not so friendly?) man with a great country drawl. Listeners of all ages will be captivated by yet another perfect blend of storytelling and narrating. Everywhere 12-year-old Andrea Carter goes, trouble follows. Even in the middle of the main street in Fresno, California. When Andi takes part in a reckless, impromptu horse race with her friend Cory, she nearly tramples her new teacher - not a good way to start the fall term! That mishap is only the beginning. Good intentions just aren't enough to keep Andi out of trouble. When an escaped prisoner forces his way into the schoolroom, Andi must make one of the hardest decisions of her life. The greatest way we see Andi step up and do the right thing, despite her fear, is when she offers to be taken as hostage instead of the one girl in the school who doesn't like her (and Andi doesn't like either). This decision in itself speaks of Andi's character growth and lays the groundwork for even more growth. From the race that nearly killed Mr. Foster to Justin's remedy for Andi's amnesia, I thought all the events and character choices of the story were realistic -- portrayed very realistically by the skilled Annette Romano! I also really appreciated the theme of this book: whether it was the author's intention or not, I took away the empowering encouragement that God uses all types of personalities. The greatest conflict in the book takes place over Andi's personality. Mr. Foster, her teacher, thinks she's out of control and nothing like a young lady because she races her horse, plays baseball with the boys, and is mistakenly blamed for various kinds of trouble. While Andi does have plenty of tomboy tendencies, she also knows when to rein them in and show the good breeding of her family. A resolution is hinted at when Andi offers herself as hostage because she knows her "tomboy tendencies" will enable her to survive the experience. A full resolution is reached at the end of the book when Mr. Foster recognizes this truth, acknowledging to Andi that it was her personality (speaking up, offering herself as hostage) that saved his daughter's life. I appreciated the reminder that God gives us different personalities and backgrounds to equip us for our unique roles in His story. 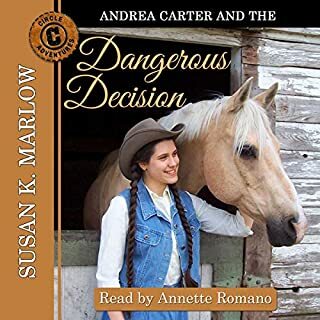 Thank you, Susan K. Marlow, for another grand adventure, and thank you, Annette Romano, for another satisfying narration! Twelve-year-old "Andi" Carter attracts trouble the way her palomino horse, Taffy, attracts flies on a hot summer day. Lately, she can't do anything right, from forgetting important chores to putting herself in danger with her brother Chad's wild stallion. After a particularly scary incident where Andi gets in trouble once again, she wonders if her family would be better off without her. So she saddles up Taffy and leaves the Circle C ranch. But her escape quickly leads to frightening encounters with a horse thief and a vicious young lady. I first read the Circle C Adventures when I was around Andi's age. I loved Long Ride Home even then, but now, as a 22-year-old grad student, I found myself loving it even more as the fabulous narration of Annette Romano brings Andi's story to life. I'm a big fan of audibooks, and as a narrator Romano does not disappoint -- she does a great job using different voices for the different characters, and her Spanish accent for the Spanish-speaking characters is pretty authentic. Even though I could vaguely remember what happens, between Susan K. Marlow's storytelling and Romano's narrating, I was riveted from the first seconds to the last. A story well written, and a story well read!